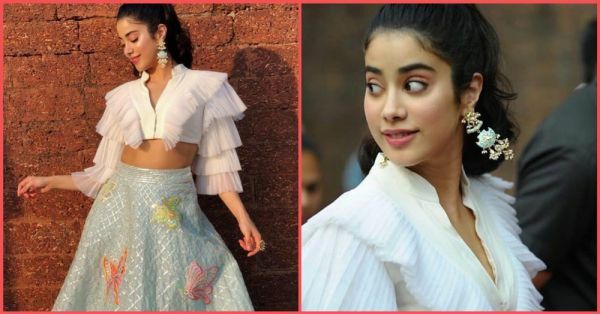 Janhvi Kapoor Made Our Hearts Go *Dhadak* With This Gorgeous Lehenga! 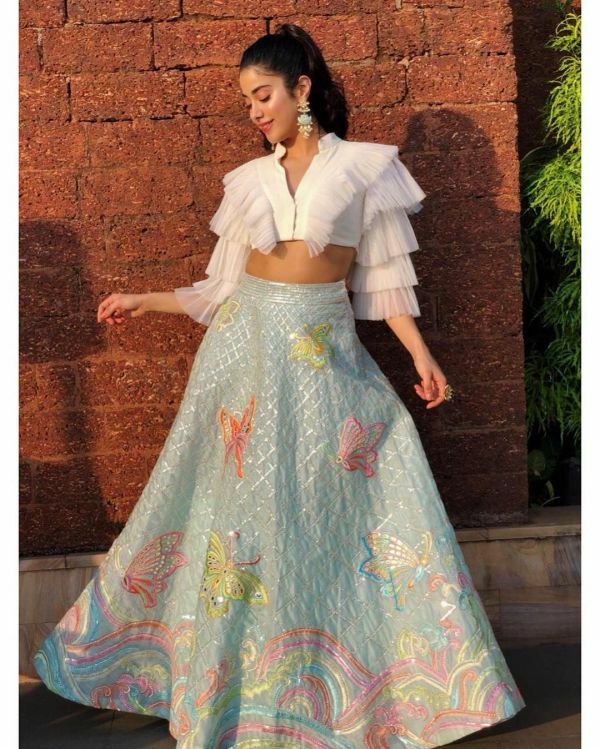 Janhvi Kapoor, the Dhadak star was recently seen wearing an Abu Jani Sandeep Khosla lehenga which stole our hearts. This contemporary lehenga is styled by Tanya Ghavri, the celebrity stylist who was recently responsible for Kareena Kapoor's gorgeous rose gown as well. Janhvi is known for pushing the boundaries with whimsical and minimalistic designs, which aren't just beautiful, but they're practical too. This lehenga Janhvi wore to the International Film Festival of India in Goa has a white ruffled top which gives her traditional skirt a modern twist. A Chinese collar, a buttoned front, details like that are the perfect way to draw attention to your outfit without going overboard with embroidery and intricate work. But, let's take a minute to admire those gorgeous earrings she decided to pair with her outfit. The 'Peppermint Enamel Long Earrings' (as they're called) are from the Jaipur Gems label and definitely add a little extra to her outfit. 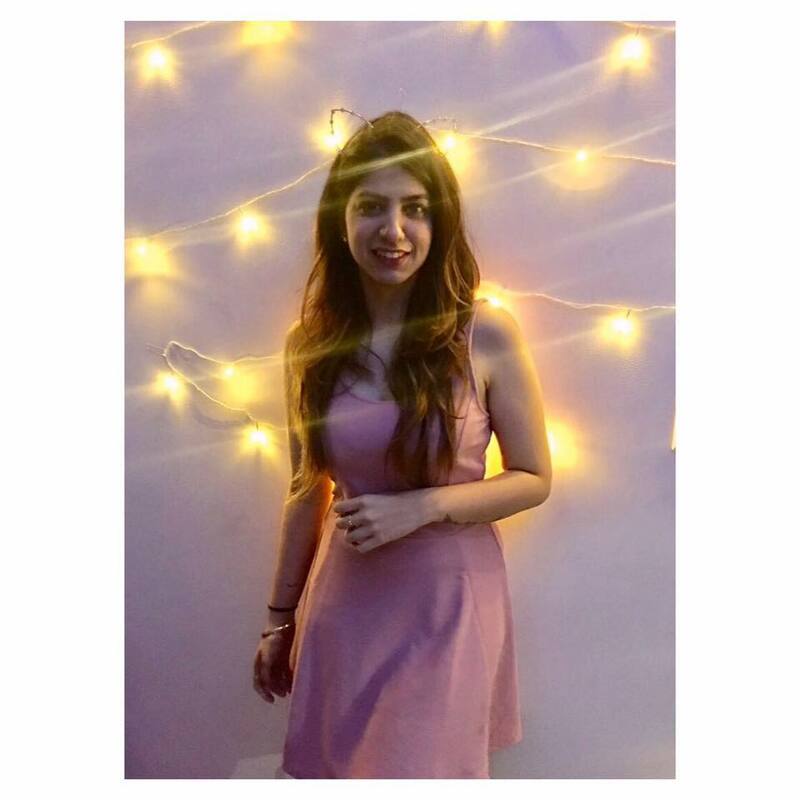 So if you're attending a beach wedding this season, and you want to keep things light and breezy, you can pair your heavy Banarasi skirt or gota patti lehenga with a textured crop top to recreate Janhvi's look. A brave yet safe way to create a statement piece. So, here are our favourite picks in neutral colours that you can mix-and-match with your Indian skirts. We promise, all eyes will be on you! A ruffled white crop shirt that can be paired with a simple lehenga skirt is the perfect casual and minimalist look. Styling tip: knot the shirt at the hems for a more bohemian vibe. It'll also give your waist more definition. This top works great when you want to tuck-in your blouse into your brocade or Banarasi skirt. Just be sure to accessorise the outfit with art deco-style jewellery to add some more fun! A simple and whimsical crop top is a stape for a beach wedding. It's breezy and perfectly incorporates a playful, summer vibe. Pair one like this with a pastel, net lehenga skirt, and your outfit will instantly get a Goa-upgrade. Wedding season is here ladies! It's time to get creative!